Welcome to Send-Me Services home page. 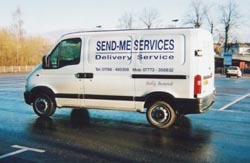 Send-Me Services was formed in the year 2000 and operates an evening and weekend delivery service from a base in Stirling, Central Scotland. We provide a fast and friendly service for both public and commercial sectors. Deliveries can be made locally and throughout Scotland. Why not check out our prices? Send-Me Services provides a flexible and responsive service that can offer you a personalised and dedicated service for any delivery large or small. We operate a collection and delivery service from shops, businesses, retail parks, cash & carry's and warehouses. We can deliver small and single items, domestic and commercial packages and business documents. Our service also meets the needs of those needing urgent or last minute delivery action. A removals and a rent a Van and Driver service can also be provided. We are fully insured. No job is too small. Our prices are very competitive and discounts are available for multi-drops and contract work. Small local deliveries start from £5 upwards. Fast Friendly and Fully Insured - Our aim is Total Customer Satisfaction.